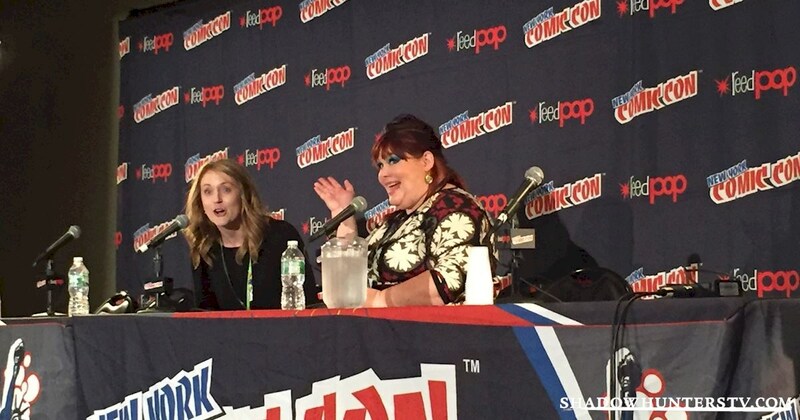 Keep up to date with Cassandra Clare's live Q&A panel right here! Here's our round up of the whole event so you don't have to miss a thing! Remember to scroll to the bottom and work your way up! Cassandra will be hanging around Comic Con until later today for her autograph signing! Stay tuned and we'll post some photos! Want cool Shadowhunters stuff sent straight to your phone? 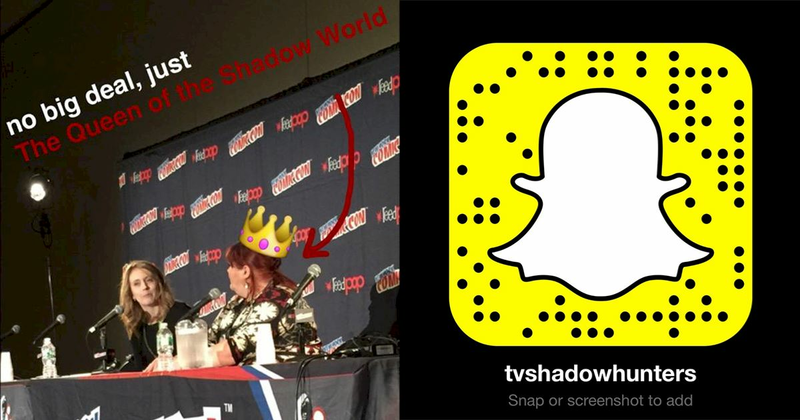 Snap the barcode in Snapchat to follow tvshadowhunters! 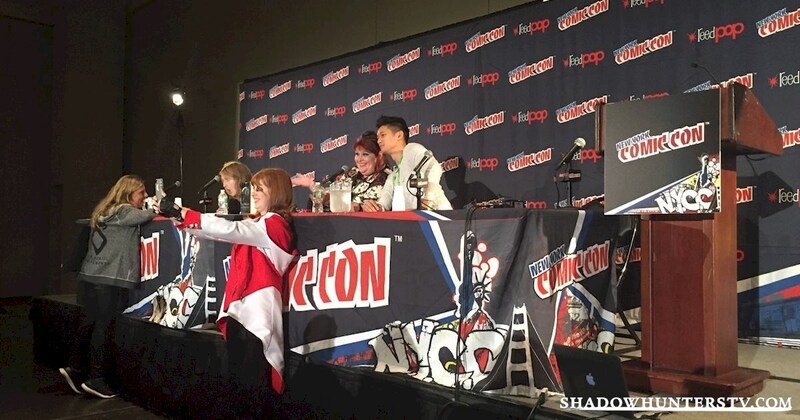 Harry Shum Jr has kissed @cassieclare & high fived the whole room. I like him. He's a firecracker. Cassie said that she knew Jace's name had to be broken down into two letters because of the mystery box in City of Bones. The name had to be a clue for the audience that people wouldn't pick up on. Cassie says she spent hours reading through baby name books, and when she saw it and she thought, "can I break it down into something?" And excitedly realized that she could. Interestingly, Cassie says she found the name Jace on the same page as Cassandra. A selfie with Cassandra AND Harry! A quote about how much he enjoys playing the character and making the scenes happen: "On this particular show, there's so much to draw on from the books, there's snarkiness and there's sassiness and there's also compassion and vulnerability." "Glitter, eyeliner, hair that can reach the heavens." 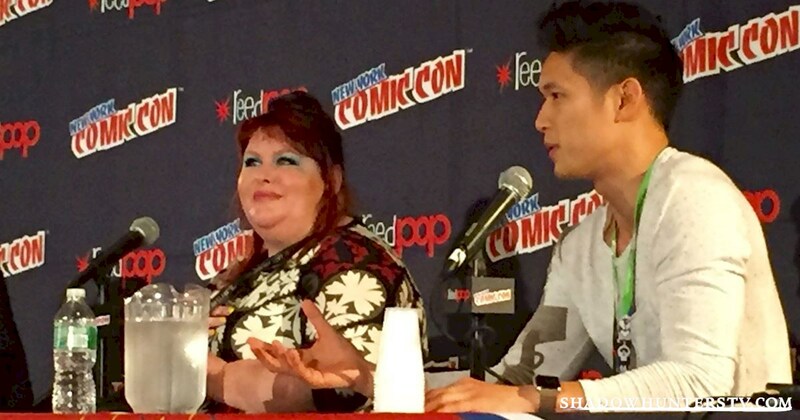 Harry said from the outside Magnus is a very glitzy character, but underneath he's a really compelling character. Harry liked that Magnus has been through so much, and there's so much experience that he's still dissecting and unpacking. The big reveal is finally here! Now revealed! The cover of Lady Midnight, first in the forthcoming Dark Artifices series! Out March 8, 2016! The moment Harry turned up! She was really excited to vote on who was cast and who they were going to pick. Her line: "It's a great adorable cast. they really love each other and they're really committed and they're really super nice too...."
This answer got interrupted. Because you guys, Harry Shum is here. One fan is very happy to have gotten a selfie with Cassandra! After a quick discussion about the difference between realism and non-realistic fiction, Cassie made the point that all stories are about people, so the key to writing is to think about the main characters. To ask what the characters want more than anything else in the world, and do they get the thing they want? And this quote, we loved: "Know what your characters want. If they get it, it's a happy ending, and if they don't, it's a tragedy." Cassie also suggested that authors describe their characters by writing out all the things about them and finding the one thing that sticks out. It's a good hook. A quote! : "I would filch a witchlight. It's very useful. It lights up, it doesn't need a battery. I wouldn't have to trip over things in the dark. t'm a human, so I don't think I would use steles or runes, but I would go with a witchlight. Portable. Light." Fans asking questions - look at the line! How many hours a day does she write? However long it takes to write 3000 words. That's her daily word goal. Sometimes it takes 4 hours, sometimes it takes 12. Impressively, Cassie says she often works between 6-8 hours a day on average, the same as any other job. 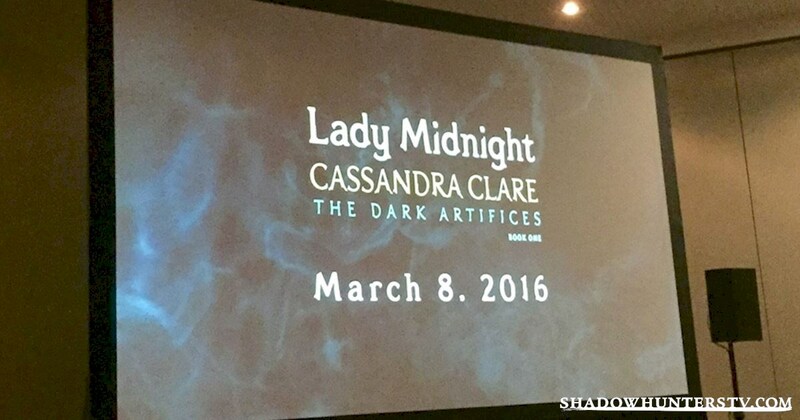 Where did the Lady Midnight title come from? She was inspired by a Leonard Cohen song called "Lady Midnight." She liked the idea of a very mysterious and dangerous woman embodied in the song. Here's a quote we loved. "Until the Clave is changed completely, that story isn't over. Oh boy. That's at least six more books." Does she base characters on people she knows? Yes, sometimes! It turns out the story of Jace and the spaghetti bath is actually a story of one of Cassie's childhood friends. In her words: "You take some experiences from other peoples lives all the time, because that's how things feel real and textured." Does she have a "bible" that keeps track of the characters? Cassie says she does - a big multi-faceted, multi-colored document that has tabs, and copies, and timelines. There are family trees, there are details of the timelines of each character. And these are double-checked really carefully. Right off the bat, moderator Amy Wilkinson (from Entertainment Weekly) asked Cassie what her favorite part of being an author is. Her answer? "Meeting other authors, getting to be in a room with them and being like...hiiii?" Cassie's biggest starstruck author moment? Meeting Suzanne Collins. "When I met her she was knitting, and I was nervous, so i just sat there and watched her knit." Ultimately, it went okay and they had a nice chat. But other favorite authors she's met include Philip Pullman and Rick Riordan. Cassandra Clare gets things started! We'll also be covering this live on Snapchat! 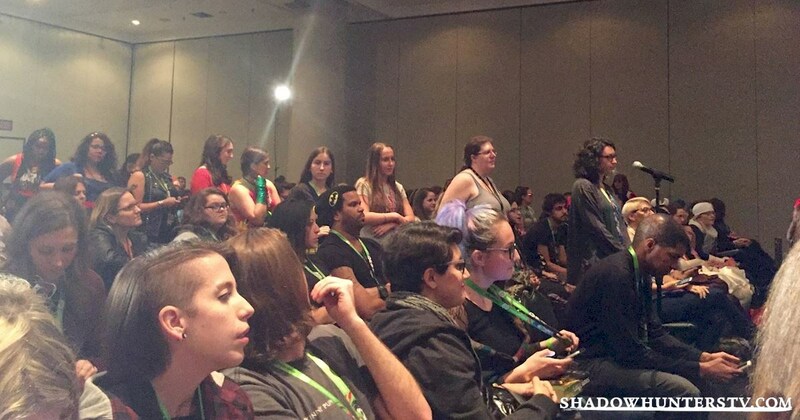 Follow tvshadowhunters on Snapchat to experience the panel there! 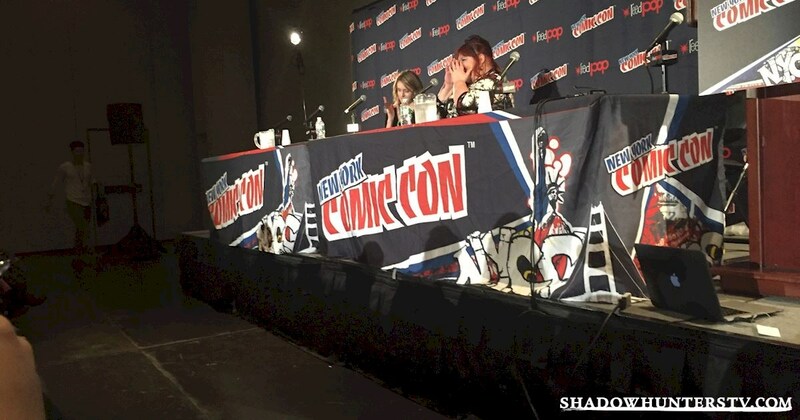 For all those of you who haven't managed to get to New York Comic Con this weekend, don't despair! 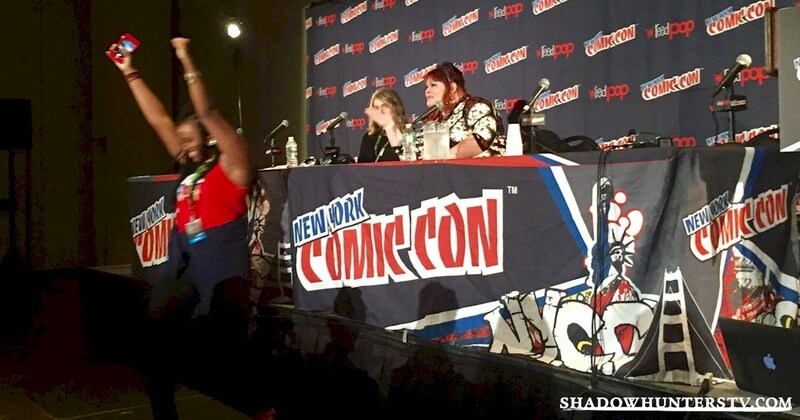 We're covering Cassandra Clare's Q&A panel live right now so that you won't miss a thing! Cassie is all prepped and ready! Off to NYC Comicon! 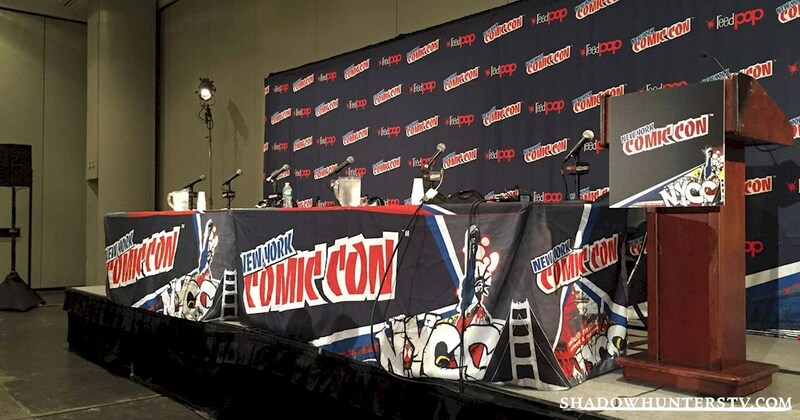 I'll be tweeting from there and look out for the Lady Midnight cover reveal around 2PM EST! We get it. Magnus Bane always makes us ALL a little uneasy about our appearance! Cassie looks amazing! 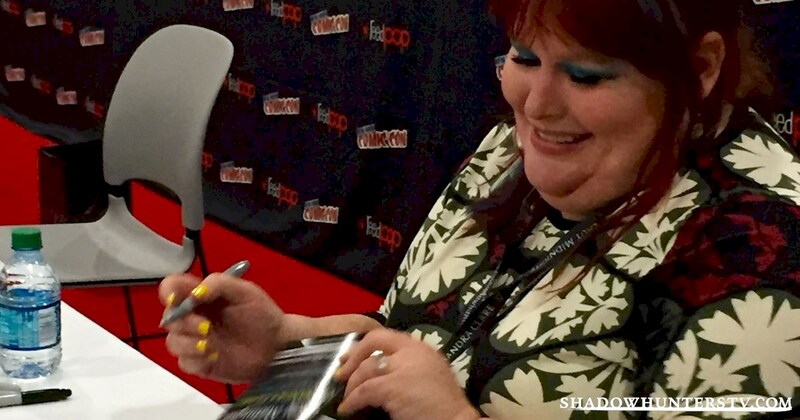 @cassieclare Cassie your makeup is amazing! 😍 Have a great time!